Walter celebrates Destination Saigon being March's book of the month at Better Read Than Dead, Newtown. Dia Tang is the Vietnamese name for an important Mahayana Buddhist Bodhisattva known more commonly in the West by his Japanese name, Jizo. Dia Tang is a central figure of worship because he is the protector of the dead, and is the Bodhisattva people appeal to for information about their loved ones who have passed on. In the main hall of most temples, he is the figure to the left of the main shrine, and is distinguished by his crown-like hat and the pilgrim's staff he is usually holding. He is also normally the central object of worship in the Hall of the Dead, that part of the temple where people's ashes are normally kept in porcelain urns. So while he is an important part of religious life (the memorialising of the dead is one of the central religious duties of all Vietnamese people) I wouldn't suggest he was a "popular" figure. You never encounter busy shrines to him that have been erected by lay-people in the way they are for Kwan Yin, for example. And he is rarely to be found as a statue in people's homes. I think the associations of death that surround him are simply too strong for people to feel comfortable in his presence. 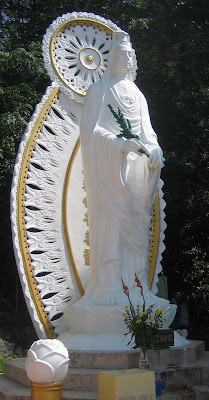 You do encounter him, however, in graveyards (and there is an enormous graveyard on the outskirts of Ho Chi Minh City), often in large and expensive statues that have been erected on top of graves. I have wanted to go to the Ho Chi Minh City cemetery and photograph it for many years, but my Vietnamese friends refuse - they think it is too spooky, and too disrespectful to the dead. In Japan, of course, the figure of Dia Tang (or Jizo), while still considered the special protector of the dead, is an altogether more popular figure, and is frequently represented as an adorable baby monk. The complicated reasons for this are set out in Jan Chozen Bays' fascinating book Jizo Bodhisattva - an essential read for anyone interested in Buddhism. This photograph was taken in a monk's cell in Quy Nhon. The pink porcelain Dia Tang in the foreground is new and is an import from China. Obscured behind him is a much older Vietnamese plaster statue of the Bodhisattva in a glass case. Walter Mason, author of Destination Saigon gave a talk today called "Vietnam: A Spiritual Journey" at the Swedenborg Centre to a packed audience. Guests also had a chance to get a copy of the book prior to launch date of 1st March. Yesterday I had the very great privilege to feature on the Morning Interview on ABC Classic FM, talking about Destination Saigon. It was an incredible experience - quite possibly the most intense interview experience an author could have, and here I am so inexperienced. I feel like I could do anything now. Am I giving away too much when I tell you that I had to pee about 20 times before the interview started? I was a nervous wreck, I don't mind saying. Margaret Throsby is away, so instead I was interviewed by the gorgeous Joe Gelonesi, who was warm and friendly and seemed genuinely to love the book, which was a plus. The format of the show (in case you haven't heard it yet!) is a one-hour interview interspersed with music selected by me. 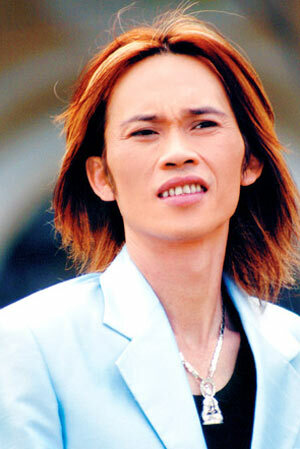 Well let me tell you, the selection of that music was about three weeks full-time work for me - a truly daunting task. Anyway, I ended up with a playlist of impossibly camp old songs, so I probably shouldn't have devoted such time to the selection process! An hour is a long time to fill on radio, and I really don't know how I did it, but when I listened to the finished product yesterday I was really pleased with it - it was fun, light-hearted and moderately interesting. If you listen to it on the ABC Classic FM website here in the next couple of weeks you can hear the entire show, complete with music. The podcast will just be the interview. Better Read Than Dead bookstore in Newtown has selectged Destination Saigon as their book of the month for March. Here's Karen with the book's promotional poster (thank you Allen & Unwin) and Better Read Than Dead's book of the month poster. Below is the author, Walter Mason with Karen in Better Read Than Dead today. People often ask me what books about Vietnam I could recommend. 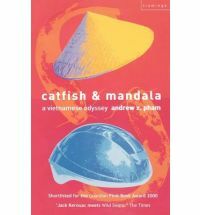 Aside from Destination Saigon (naturally), one of my all-time favourites is Andrew X. Pham's exquisite travel-memoir Catfish & Mandala. This book has been around for a while now, and has a real cult following, especially among those who have visited Vietnam. 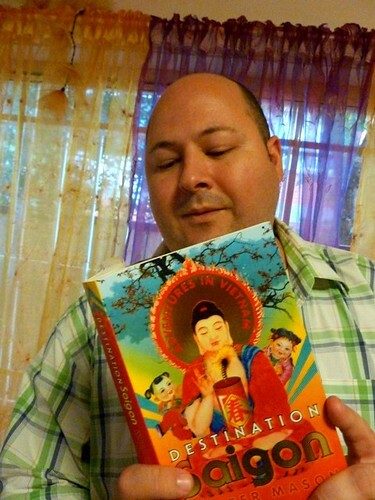 Pham is an American-Vietnamese, and in this book he decides to re-visit his homeland. A committed bike-rider and something of an idealist, Pham's return is hardly triumphant, and from the beginning he experiences cultural confusion when he cannot be the person his family in Vietnam want him to be. Throughout the book his journey through Vietnam is interspersed with stories of his life as a refugee boy growing up in the States. His wonderfully dysfunctional family (including a gay brother and a transsexual sister) are constantly examined and pulled into focus as events in Vietnam remind him of his fractured, multi-cultural experience. Pham is honest in this book, painfully so. He is unafraid to represent himself as a paranoid whinger, or to discuss difficult aspects of contemporary Vietnamese culture. In fact, I really do rate this as one of the best - and most original - travel books ever written. Essential reading if you're headed to Vietnam. Vietnam is an extraordinary country with a rich mystical tradition. Religion and spirituality are woven into people’s everyday lives, and in this fascinating lecture – richly illustrated with slides from his many journeys there – Walter explains and illuminates this wonderful place. From the misty, quiet streets of Hanoi, through the colourful controlled chaos of the Cao Dai religion in Tay Ninh, and into the surprisingly restful and transcendent Buddhist monasteries of Ho Chi Minh City, this is a never-before-seen journey into the very heart of Vietnamese devotional life. 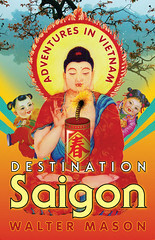 Walter Mason’s new book Destination Saigon (Allen & Unwin, $24.99) will be released in March 2010. Walter has a long and affectionate relationship with Vietnam and the Vietnamese people, including a 20 year involvement with Vietnamese Buddhism. As well as writing and speaking, Walter is currently researching his PhD at the University of Western Sydney on the history of self-help literature in Australia. Destination Saigon available for pre-sale NOW! Though not in stores yet, most places by now have Destination Saigon listed on their systems and available for pre-sale. If you place your orders now, you'll get it the minute it is released. And, naturally, wherever good books are sold. It should hit the shelves in the next week or two! The countdown begins! One of the more interesting of Vietnam's pop-stars is the multi-talented Hoai Linh. Equal parts pop star, stand-up comedian, actor and drag queen, Hoai Linh is a fascinating phenomenon in a country where the public expression of counter-cultural-tendencies is still strictly forbidden. The flamboyant Hoai Linh seems to fly in the face of all the strict official dictates surrounding music and the appearance of celebrities that the Vietnamese government still issues. At various times the government has issued bans on dyed hair, visible tattoos and piercings on male performers, though the law surrounding drag is still unclear. Certainly transgender performance has a very old history in Vietnam. As with most traditional theatrical forms, traditional Vietnamese opera and theatre always featured men in female roles for all the usual reasons: avoiding accusations of prostitution, staving off the amorous intententions of love-starved men in the countryside and ensuring that travelling theatrical troupes had plenty of able-bodied men on hand to shift, build and carry. I dare say all of these precautions came to nothing, as drag performers quickly turned to prostitution, love-starved country men only increased their affection for beautiful youths in dresses and the diva-like drag queens refused to engage in any physical work. So drag continues in Vietnam, and drag routines (normally incorporating long, spoken stand-up sequences) are a staple in the variety shows that are performed in big cities all over Vietnam. Hoai Linh seems to have taken this tradition and marked it out as all his own. He is easily the most popular actor performing in Vietnam today, and his movies, comedy DVDs and live variety shows are all enormously popular. While not conventionally beautiful - he's far too gangly and toothy for that - Hoai Linh is still possessed of a willowy charm that renders his gender-crossing work strangely believable, though all the audience is in on the joke that he's actually a man. Bizarrely, in his feature film work Linh is almost always cast as an ugly, lecherous man chasing after young women, a role I, for one, find difficult to believe him in. Today is the Lunar New Year, the most important holiday on the Vietnamese calendar. In Vietnam people have spent the weeks leading up today in a frenzy of activity - cleaning their house and doing necessary repairs, settling outstanding debts and, in many cases, arranging to go home for the holidays. People go to th impromptu flower markets that spring up in every town and city and buy cherry blossom blooms, little potted cumquat trees, pots of flowering chrysanthemums and even little chili bushes thick with colourful fruit. 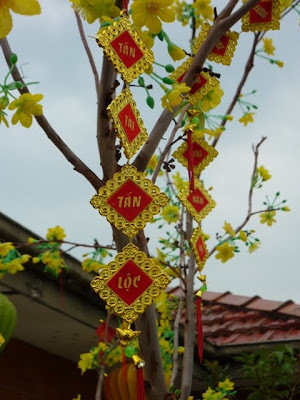 All are symbolic decorations for the period of Tet. People also decorate their homes with calligraphy of special poems, sayings and couplets expressing seasonal wishes. In Vietnam the main time of celebration is the New Year's Eve, when most people will go to temple to make an offering of money and incense in order to smooth their karma out for the year ahead. 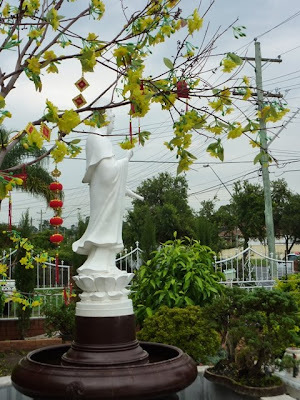 These pics were taken at the little temple just up the road from my house in Cabramatta, Chua Minh Giac. It was particularly beautifully decorated this year. Great cover, great feedback from booksellers.